Spring and summer are the best time to get outside and enjoy the fresh air. The best memories of summer nights are sitting on the porch with a tall glass of iced tea listening to the hum of insects and watching the stars. It is important that we enjoy these moments while also preserving them for our children’s future. You don’t have to do that at the expense of having a boring outdoor living area. Here are a few great earth friendly ideas for your patio. The key to exceptional Fort Worth lawn care is to use elements of the local environment, and preserve the current habitat. Blooms Landcare can help you pick everything you need to maintain a perfect balance. For example, you could use indigenous rocks and plants to landscape around your patio. You can also choose plants that require less water. This will not only help the environment but also save on your water bill! Choosing wood that is not soaked in harmful chemicals are not only safer for your family but don’t emit harmful substances into the environment. 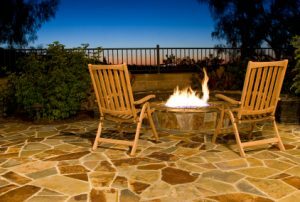 Check with your landscaping professional before choosing patio materials. Quality materials last longer and therefore reduce waste. 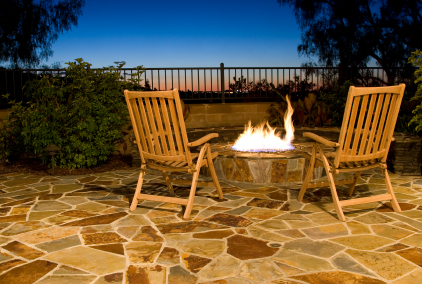 By choosing durable long lasting materials for your patio, you are making an eco-friendly decision. Blooms Landcare knows of the latest in eco-friendly materials that are available for installation. We have solar lighting available that is high quality, long lasting, and will save you money every month on your electric bill. Consequently, eco-friendly tends to mean savings for you and for the planet. It is a win-win situation for everyone involved. If you would like more tips and tricks on how to make your patio more eco-friendly, Contact Blooms Landcare at (817) 688-5352. We would be happy to schedule an appointment or to speak to a representative about how to make your patio more efficient for you and the planet.